The 2018 CommA participants and representatives from HIM, CBRC, and MHI at a working lunch during the Summit. 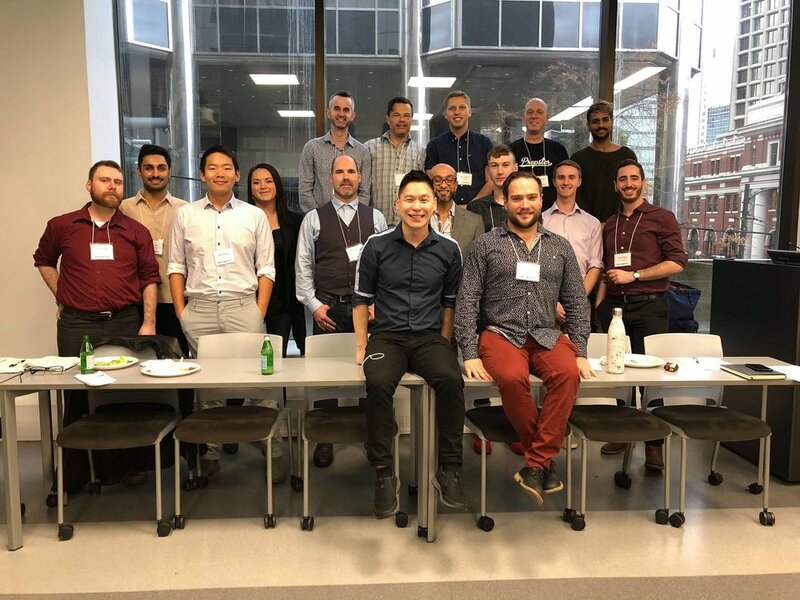 In the 10 years since its formation, Health Initiative for Men (HIM) has been dedicated to helping gay, bi, trans, Two-Spirit, and queer men* (GBT2Q) in the Vancouver Lower Mainland lead healthier lives. Our membership in the Advance Community Alliance allows us to engage community members outside of the Vancouver Lower Mainland across British Columbia. This is an opportunity for us to not only learn about the challenges and the resilience specific to their regions, but to also assist the work of individuals and local community organizations who support the wellbeing of GBT2Q communities across BC. In an effort to engage community members in BC’s smaller-urban and rural areas, HIM launched the “BC Community Advocates program (CommA)” in partnership with Community-Based Research Centre (CBRC) and Men’s Health Initiative (MHI). BC CommA is a new program that recruits GBT2Q community members who are active in their communities to attend CBRC’s Summit in Vancouver, an annual conference on the unique health needs of GBT2Q men. This year, we co-sponsored 13 community members from diverse lives and experiences across BC to attend the Summit’s many presentations, seminars, and workshops. In addition, CommA participants had the opportunity to meet with a range of professionals in the field to learn more about their work, with a goal of facilitating relationship building. The program also created meaningful opportunities for participants to learn from each other, enabling peer knowledge and resource exchange to strengthen their understanding and access of tools and strategies for GBT2Q health. The participants also attended training sessions on how to engage their communities in queer-health matters and were supplied with a variety of sexual health resources- such as pamphlets and posters on PrEP and GBT2Q mental health- to distribute in their communities. One such event took place on the Saturday after the Summit, when folks visited and toured the HIM on Davie Health Centre and main offices. They learned about the operations of HIM’s Health Centres, which provide confidential full spectrum of sexual health testing, counselling and coaching services. There are similar models functioning in other areas of BC such as CoolAid in Vancouver Island and PRICK! in the BC Interior, and they are valuable services in their communities. A number of the participants got in touch with HIM to discuss implementing, lobbying for, or improving certain services in their home communities. CommA participants described their experiences as inspiring and rewarding. They left with new knowledge and enthusiasm for doing meaningful community work. One participant said, “the sense of pride and hard work in the presenters [at the Summit] rekindled the fire in me to continue the work that still needs to be done back home.” Participants found sessions regarding the high rates of mental illness among GBT2Q men, and the need for resources in less-densely populated regions especially resonant. At Health Initiative for Men, we believe it is important for all gay, bi, trans, Two-Spirit and queer men,* regardless of geography, to have access to appropriate health resources. We are excited that our membership in the Advance National Alliance enables us to do what we can to continue supporting 2018’s CommA participants in their work to improve the health of their queer communities, and to invite a new cohort to join us at next year’s Summit!